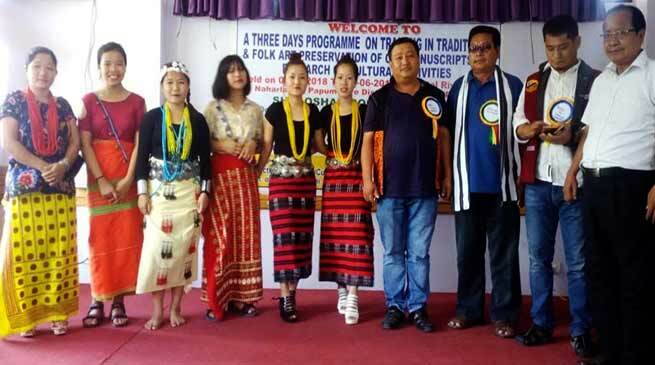 The three days training programme on traditional and folk art preservation of old manuscript and research on cultural activities concluded here at a city hotel on Saturday. District Art and Culture Officer of the department of Art & Culture, Ashan Borang has called for its propagation and preservation. Underscoring the importance of rich cultural heritage of indigenous communities of the State, Borang said, preservation is essential for maintaining own distinct cultural identity, adding, this rich heritage must be passed on to the younger generation. Lauding the efforts put in by HHMAET team for preservation and promotion of indigenous culture, Borang said, beside handloom and handicraft products and items it will encourage women to be financially independent and generate a job opportunity. “The role of the society is of utmost importance in balancing disappearance of our distinct indigenous culture in the near future,” he said while cautioning that modernity has adversely affected the traditional and culture of tribal society. Guest of honour Assistant Art and Culture Officer of the department of art and culture, Gunia Nabam asserted that the HHMAET alone cannot preserve and propagate indigenous faiths, traditional and culture. Adding that role of parents, teachers and elders’ endeavour and effort is equally required. Soliciting with the Bosang that establishment of handloom will generate a job opportunity for the unemployed and society of all tribes to support the HHMAET to strengthening the organization, Nabam appealed people irrespective of religious groups not to blend the religion and culture rather to practice the same separately. He further stated that visitors from outside do not come to Arunachal Pradesh to see its materialistic development but to see and explore the rich culture, traditions and customs of the indigenous communities. In his key note address HHMAET chairman Jaro Bagang appeal all stake holders to introduce traditional dress in every government school at least two days in a week, He urged youths to carry forward ancestors traditional and culture so that younger generation may followed the same path of propagation.